The zones for the London Congestion charge have been increased , so its best to check the London Congestion charge map before taking out your rental from London Car hire. If you decide that you wish to take your hire car into central London and the congestion charging zone, firstly you need to know the times and whether the charge is in operation at your time of entering central London, the London congestion charging zone hours of operation are generally 7am until 1800 hrs every day apart from Bank holidays and all of the days between Christmas and New years Day, these are designated non charging days. Once you have checked the map and the times and know that you must pay the London Congestion charges, its best and cheapest to do so on the day of entry, the price goes up if you pay the day after. 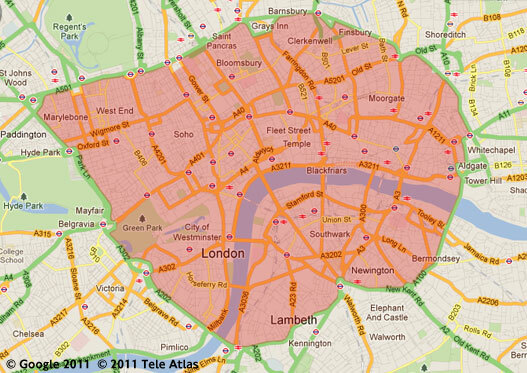 Congestion charge payment in London may be made on line, by phone or via a designated shop. Whatever you do with your car rental in London, if you have entered the charging zone, just play it safe and pay the days fee, the alternative is likely to be a a London congestion charging penalty charge notice and you will end up paying £160!! Some of our vehicles are covered by Congestion Charge AutoPay. This means that we’ll have paid the Congestion Charge automatically as part of our fleet scheme. You just need to let us know by the end of your hire which days you went in and we’ll add it to your invoice*. Please note, some vehicles such as cross hired vehicles or specialist vehicles are not covered by our fleet scheme. It is your responsibility to ensure that you have checked the vehicle is covered before the end of the charging day. If you’re unsure – please just ask. *If you do not notify us you may be subjected to an admin charge of £25+VAT.